Written by Lauren Forse on Nov. 12, 2013 . Last update on Nov. 12, 2013. South Africa is well known for being one of the world's best wine producers. In fact, the country overtook France in 2010 to become the UK's top wine supplier. Living there, we are lucky enough to be able to sip it while soaking in the beautiful sights that SA has to offer. It's only in the last decade that South Africa has started to produce fresh, innovative and delicious new wines that combine the best of the Old and New Worlds. Wine is part of the history in this area, and it is amazing to be able to taste that change. With prices from under R30 to above R250, anyone with a palette for adventure can sample the excellent fermentations that are available. Wine tours are a great way to find what you're looking for. Tastes vary greatly from sweet to dry, red to white, and experts on the vineyard tours can help you to find what you're searching for and maybe even better. Wine tastings do not only involve sampling wine in a stuffy room accompanied by snobby epicures, but include being shown the process of wine making, viewing the beautiful landscapes of the vineyards, and being shown how to properly appreciate wine. Compiling a list of what you want to get from your wine tour will help you to choose the right one for you before you make a visit. Established in 1694, this is one of the oldest wineries in the Stellenbosch region, located in Helderberg. It really took off when Springbok rugby champion Jannie Engelbrecht bought the company in 1977, consistently churning out excellent wines such as a red Bordeaux-style blend and a fantastic Shiraz or Syrah. Extremely popular and debatably the best Cape producer of Pinot Noir and Chardonnay. It also has strengths with regards to the local Pinotage grape. Hemel en Aarde Valley, Hermanus. With the Queen of England's seal of approval for its Sauvignon Blanc, this award winning winery based in Helshoogte Pass, Stellenbosch-Franschhoek is a producer of modern classic. With a beautiful path of eucalyptus trees leading to the winery which compliments the Cabernet Sauvignon. It's a treat for the eyes as well as the tastebuds. Established by Governor Willem Adriaen van der Stel in the late 17th century, this is arguable the most grand of the Old Cape wineries. The cellar was taken over in the early 2000s and transformed into the most adorned and decorated winery of the cape. Famous for reds and whites to rival Bordeaux. Located in the mountains, there is value in visiting purely for the journey through the wild Western Cape mountains. Only recently, maybe a few decades ago, Dawid Niewoudt took control, putting a stop to the strict on-site only consumption rule that pre-existed. The vineyard now flourishes at 1,000 metres above sea level. 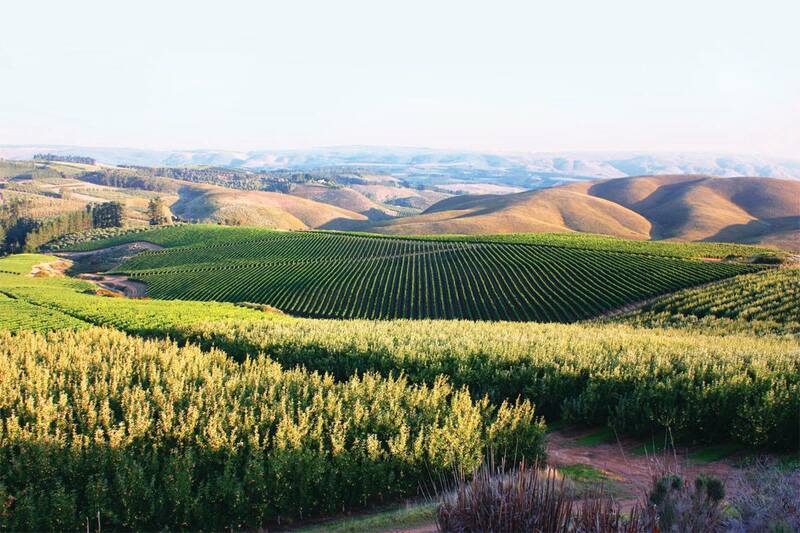 Boasting the highest wine farms in the cape and consistent production of award-winning wines.